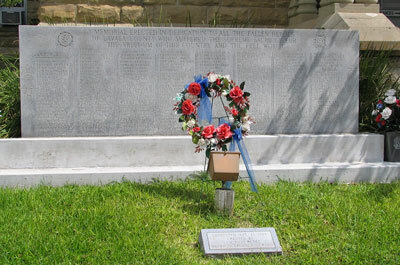 Memorial at the Lavaca County Courthouse "erected in dedication to all the fallen heroes of Lavaca County who suffered the supreme sacrifice for the freedom of this country and the free world"
Inquiries and anecdotes concerning residents and contributors to the area are solicited for posting in the DeWitt Colony Family History section. General discussion about the colony and its role in Texas history are solicited for the Feedback and Discussion section. A large monument in the Hallettsville Memorial Park honors particpants in the Texas Revolution at the Alamo, Goliad, Gonzales, and San Jacinto. Individual markers honor Stephen Tucker Foley, Joseph Kent, Paul Sccarborough, and Captain Leiper Willoughby. For San Jacinto veterans, links are provided to biographies at the San Jacinto Museum of History web site. Index of Confederate pension applications made by Lavaca County residents, contributed by Vera Mendoza. View pension application of Elizabeth McGary Kornegay, widow of David S. Kornegay. View letter regarding pension application of Mary Buford Fitzhenry, widow of Almond Fitzhenry. Index of Confederate Indigent Families in Lavaca County (1863-1865), contributed by Vera Mendoza. Web site for the Texas 8th Cavalry (also, known as Terry's Rangers). See list of Terry's Rangers with Lavaca County connections. There were several men from Lavaca County on the Unit Roster. This is a project to gather history of CO K and of the men who served in this company. Historical markers honoring Civil War participants Arthur Pendleton Bagby, General John W. Whitfield and Whitfield's Legion. Data on servicemen buried in France or listed as missing. Read news articles about the Downed Flyers. Data on servicemen buried overseas or listed as missing. Military records are available though the National Archives and Records Administration. Please contact Regena if you find a bad link or would like to suggest a link.